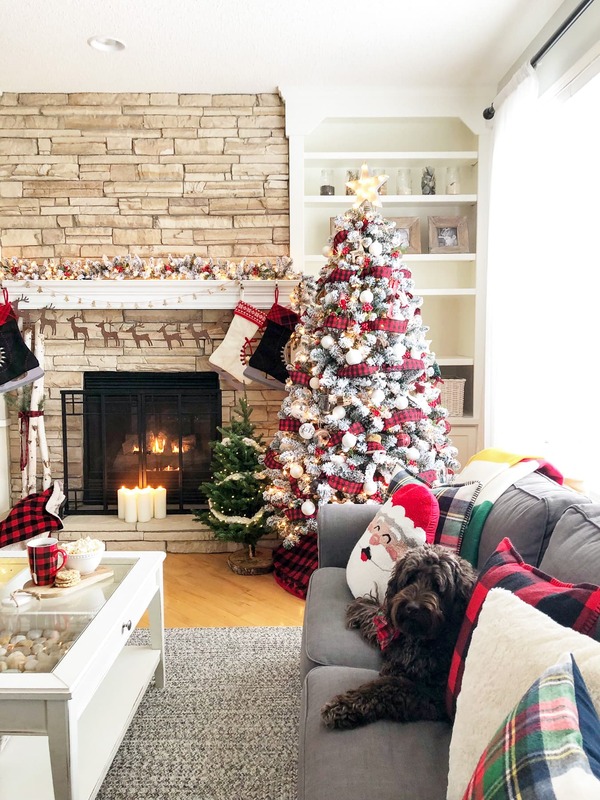 A Classic Canadian Christmas Home all decked out for the holidays! 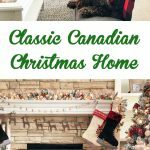 Welcome to my Classic Canadian Christmas Home Tour, I’m so happy to have you here! 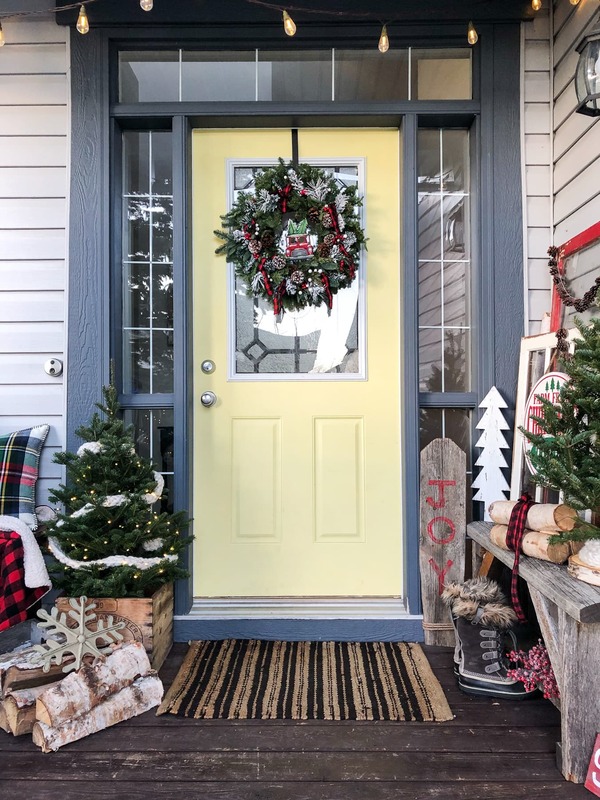 My home tour is 1 of 27 Canadian Holiday Home Tours hosted by the lovely Shannon of AKA Design and Christina of The DIY Mommy! 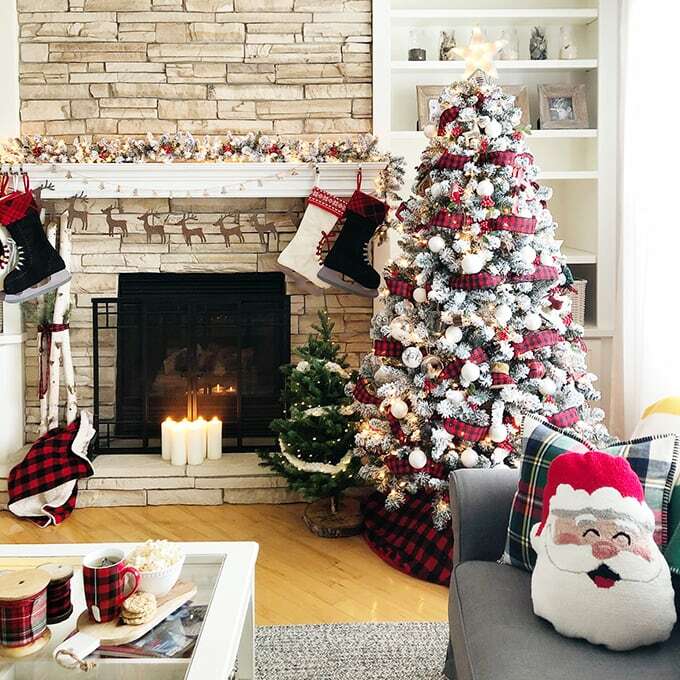 27 homes of beautiful Christmas decorating inspiration! I hope you can take a moment to take a tour of the homes…they’re all at bottom of my post. Today is my day to share, and I’m really happy to have you here! I was hoping that it would have snowed before you came so you could have the ultimate Canadian Christmas experience. But the weather, and our chinooks, had something else in mind. I’m just hoping with all my heart that we have a white Christmas this year! Anyway, the weather won’t stop me from decorating for my favourite season. 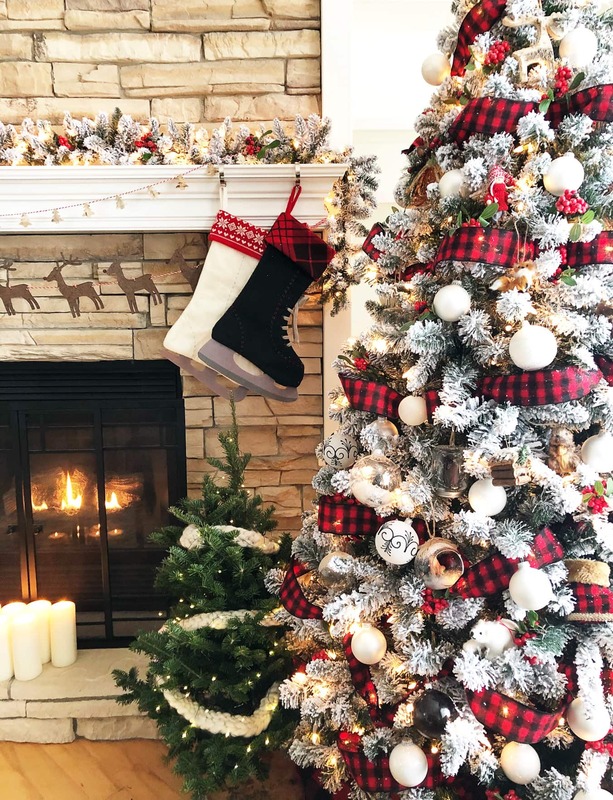 So come on in…I’m thrilled to have you here in my home all decked out for the holidays. Let’s start here at my front door. I really enjoy decorating my front porch. I love being greeted by a cheery porch when I come home. Most of the time I actually don’t think too hard about how I’m going to decorate. I just start by gathering things from around my home and let things naturally progress from there. I’m a big fan of ‘shopping’ around my home first…it’s surprising what you can find from things you’ve already got. If I don’t have to buy things, I won’t. But if something catches my eye I’ll scoop it up! 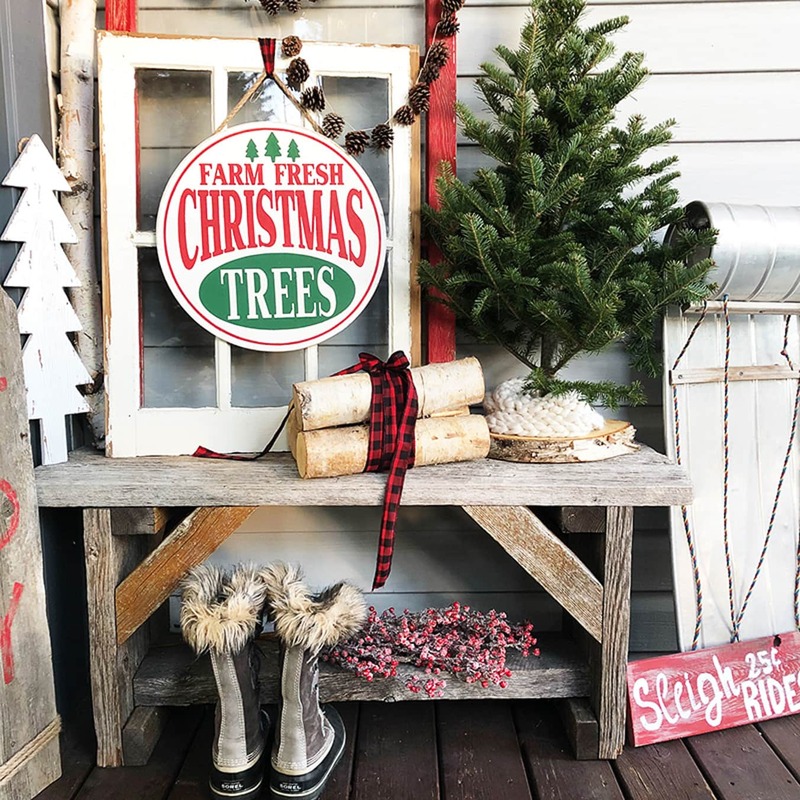 That Farm Fresh Christmas Trees sign was one of those things that I had to buy…it’s actually what inspired the theme of my porch this year. Just a simple sign, and my vision was created. If you want to see more details of my porch, visit my porch tour here. So if you haven’t noticed, I kind of have this thing with plaid and buffalo check. I can’t get enough. 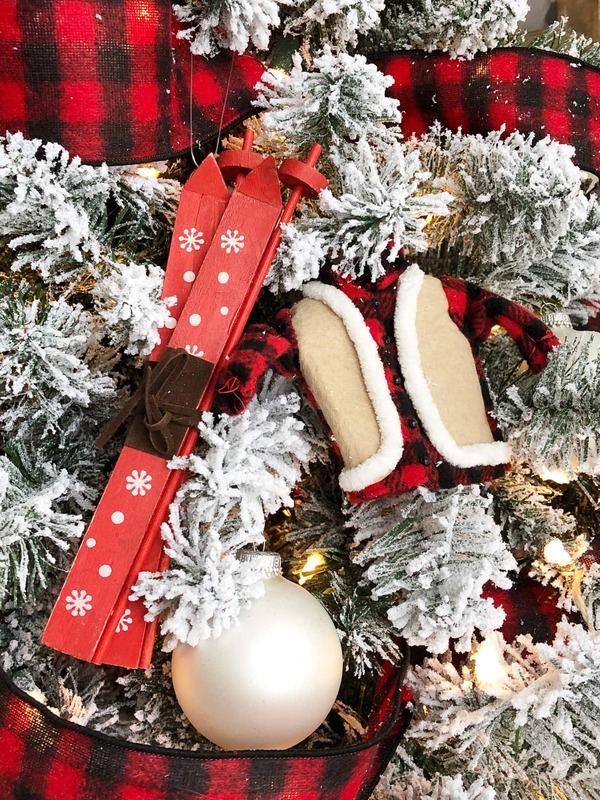 If I see something in these patterns, I have to buy it…you don’t even want to know how many stores I drove around to track down that buffalo check ribbon (ok, 7…shhhh), and I still couldn’t find it. My mom eventually found it in Edmonton, then shipped it to me and saved the day! Yes, I wanted it that bad hahahaha! But seriously though…can you see why?! It’s perfect. And so Canadian with the snowy tree, woodland animals, lumberjack jackets, moose, beavers, skis… Sigh. I just love this theme. 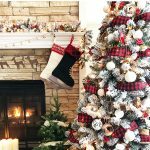 Red is very outside my every day decorating theme, but come Christmas I embrace it fully! 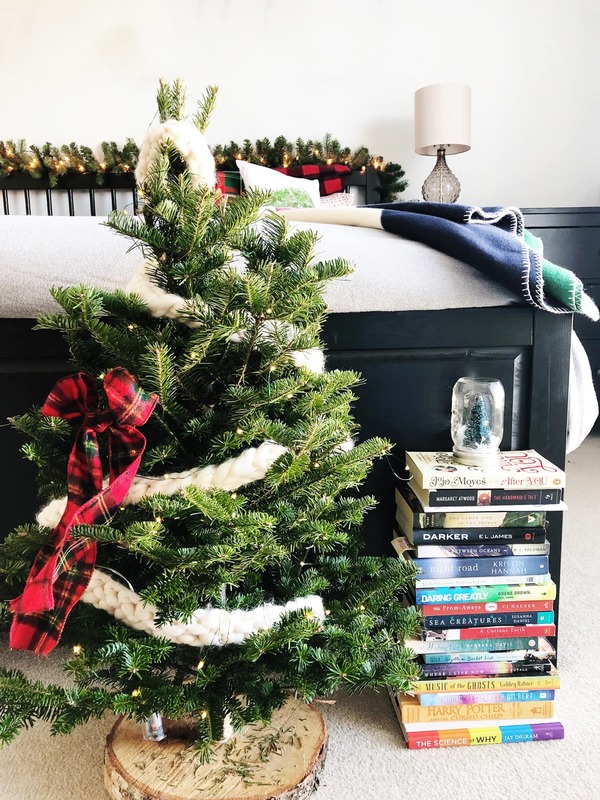 Because we spend so much time in this space, I really wanted it to be cozy and festive, but still real and functional. 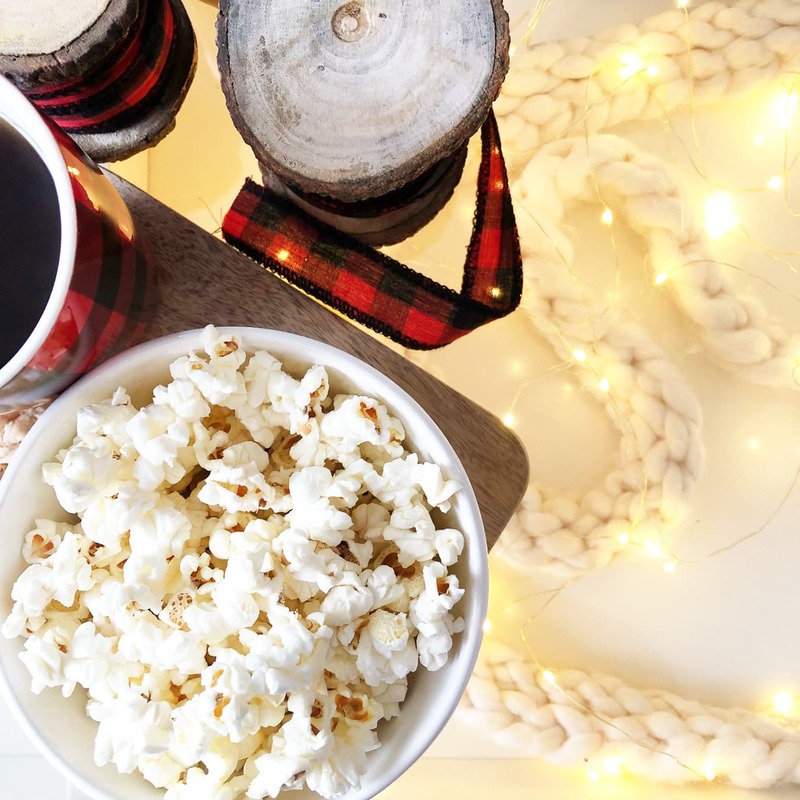 I wanted to us to be able to cozy up on the couch with snacks to watch Christmas movies in the most Christmas-y space possible. And I think that’s what I created in here. And real it is. Dog on the couch and all. But don’t be fooled by how tidy everything looks…once these pictures were taken, it was back to real life. Kids live here. A family lives here. Our coffee table is filled with X-Box remotes, coffee cups, plates, books, crayons and Lego. And I wouldn’t have it any other way. Speaking of kids…do you Elf on the Shelf? 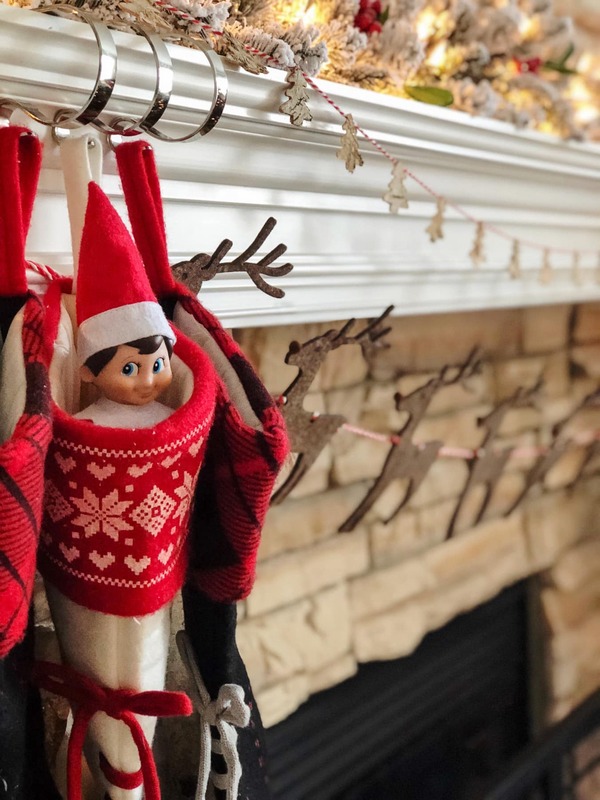 Our Christmas season officially kicks off when our elf, Ed arrives…I know that this guy is polarizing, but we don’t mind him…he just moves around each night, and every morning my littlest flies out of bed to see where he is. I can’t not love him. Aside from my living room, I actually toned down the number of decorations I used this year. 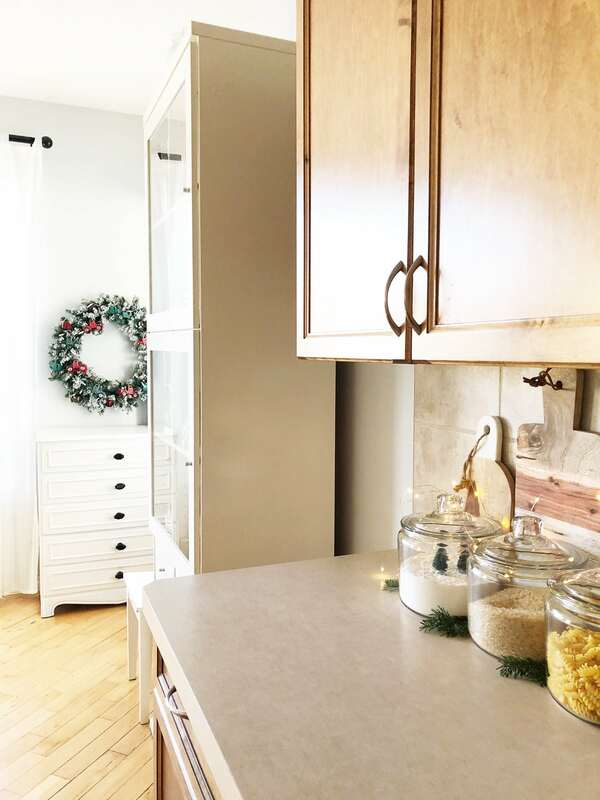 I kept things really simple in my kitchen and eating nook, and only hung a wreath and added a few things to my counter space. I’m trying to simplify things…admittedly it’s hard, but I had to start somewhere. 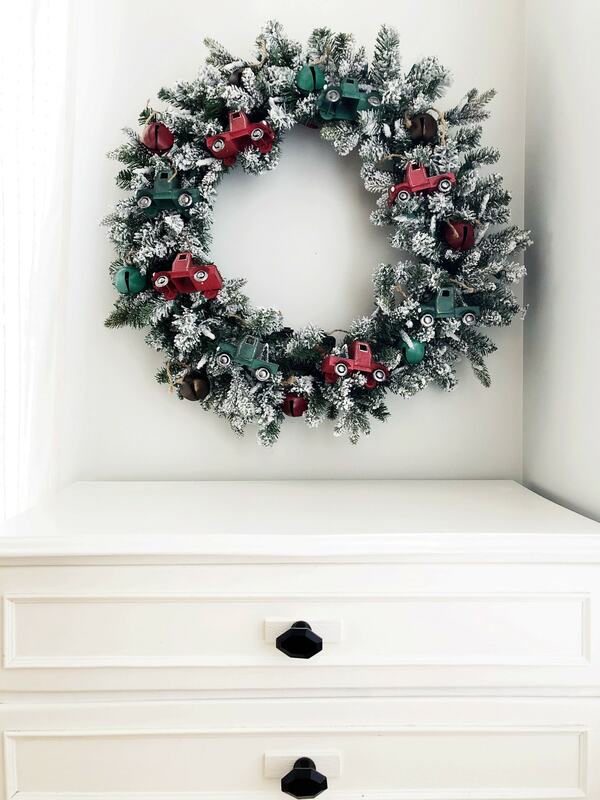 I made this Vintage Truck Wreath last year, and still love it so much. It’s a nice pop of festive colour in our eating nook. 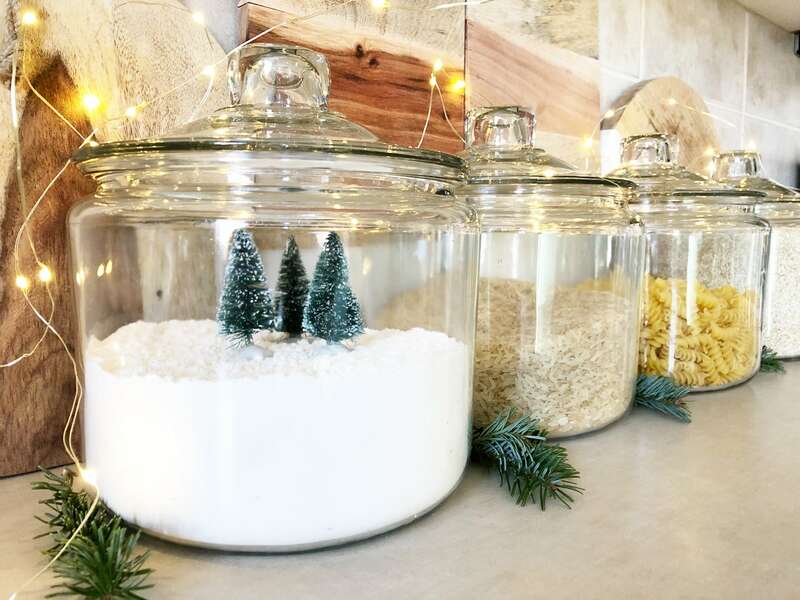 And the only other thing I did in my kitchen was dress up the counter…how cute are the little bottle brush trees in the flour. SO cute. They’re easy enough to take out when I need the flour for Christmas cookie baking too. Now up to my room. 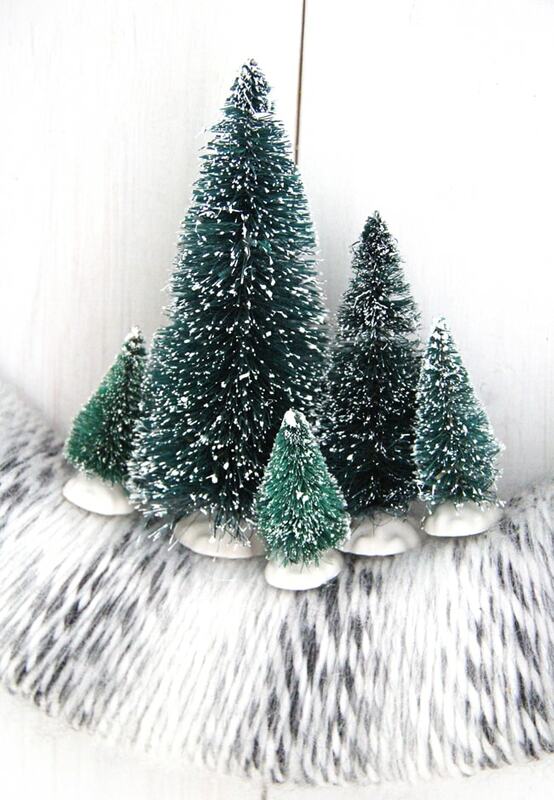 I only started decorating for Christmas in our bedroom in the last couple of years. 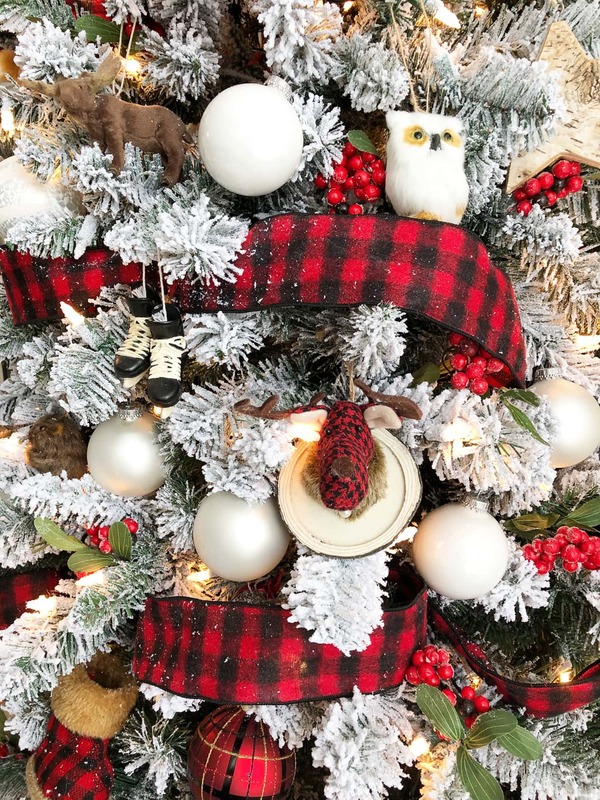 One year I kept things really neutral, then last year I went all out with the buffalo plaid…and because I’m still obsessed with buffalo plaid, I brought it back for this year. 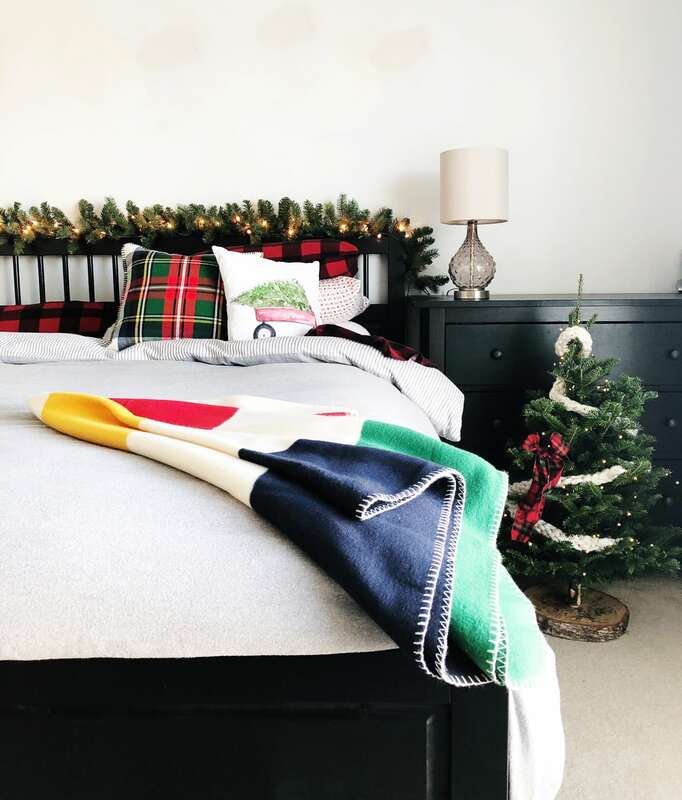 Who can resist buffalo plaid flannel sheets? Not this gal. 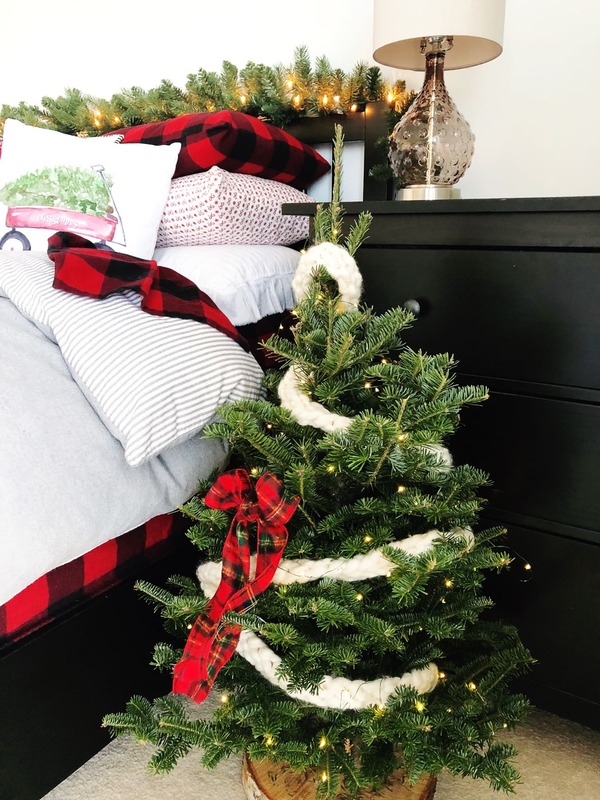 And a tree in the bedroom? Yes. So there you have it…that’s my holiday home. Now it’s time to sit down and enjoy it. 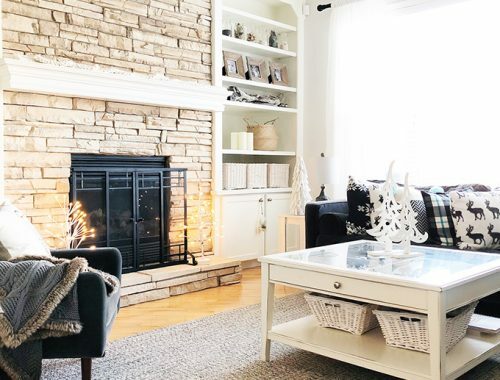 More Canadian holiday home inspiration! 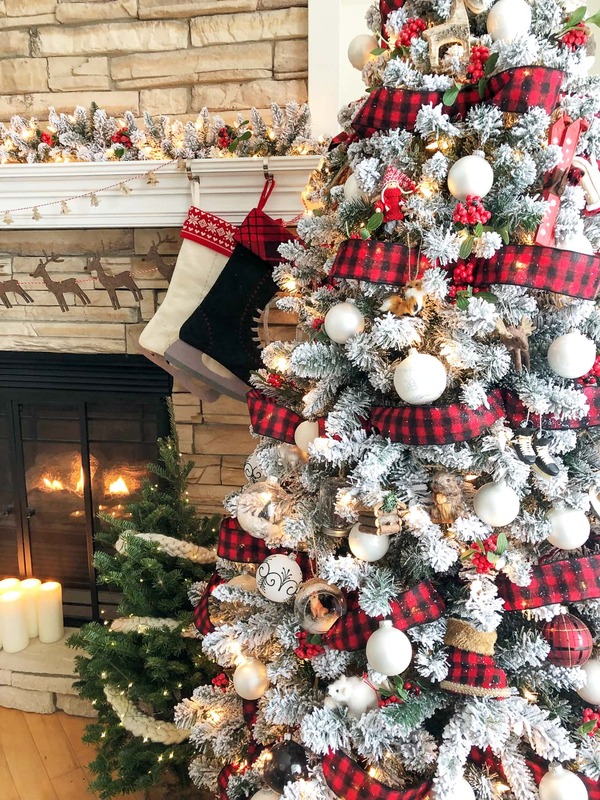 If you’re looking for more decorating inspiration, I hope you can take some time to check out these beautiful Christmas homes that are part of this years Canadian Bloggers Home Tour! 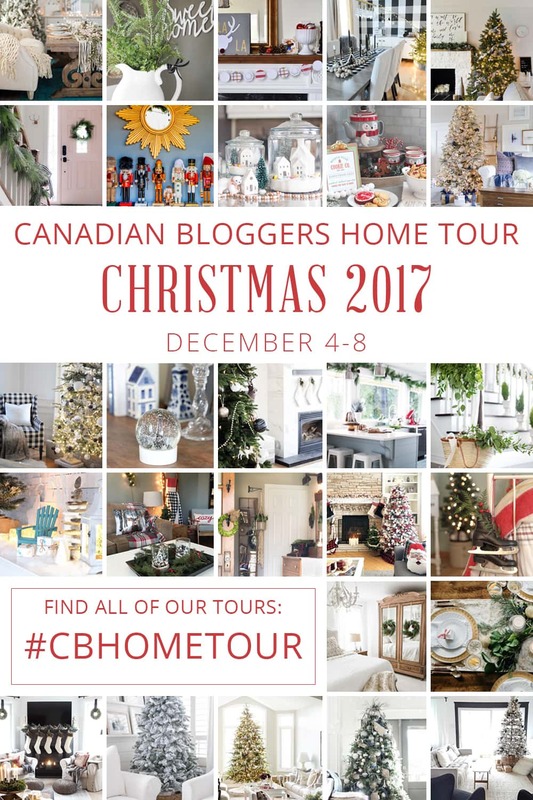 Another great way to see more is to follow the hashtag #CBHomeTour on Instagram! 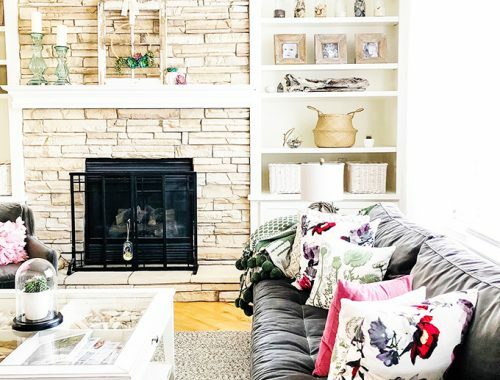 So many beautiful homes…and ideas for everyone. 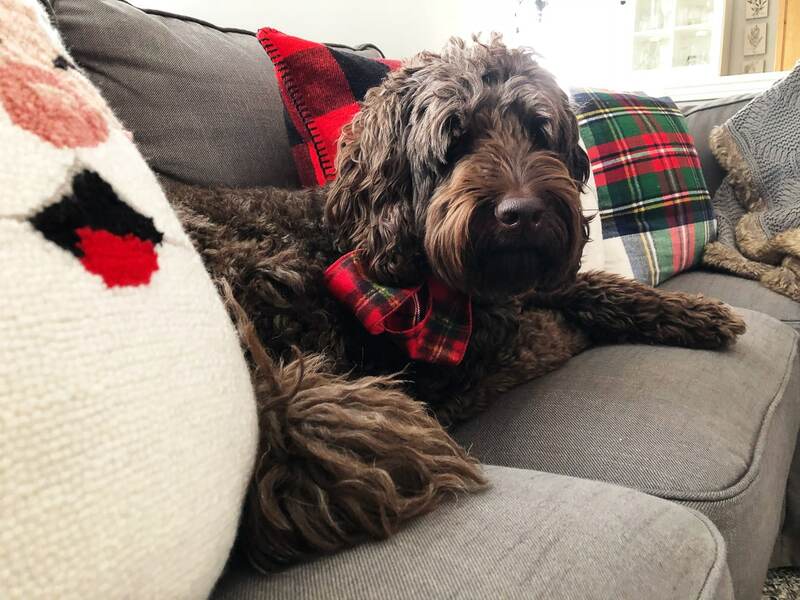 I love all the plaid! I just can’t get enough of it either! I’m so sad I didn’t think to placidity my dog for my tour. So adorable! Thanks for the lovely tour! Thank you Heather! And I wish you could sit with me around the fire too! Enjoy your beautiful snowy holiday season…I’m so jealous…it’s supposed to be 13 degrees here in Calgary today…UGH! Thank you Ariel! Flannel for life! haha! It looks so cozy and perfectly Canadian. Love that buffalo check ribbon! Jo-Anna! This is a perfect Canadian Christmas tour. Love all the details. Well done my friend. Thank you so much Jamie! Merry Christmas! I wish you could too! One of these days we’ll make a visit happen, one way or another! I think we’re heading out to the island this summer!! I always love your home tours, and your beautiful porch styling. 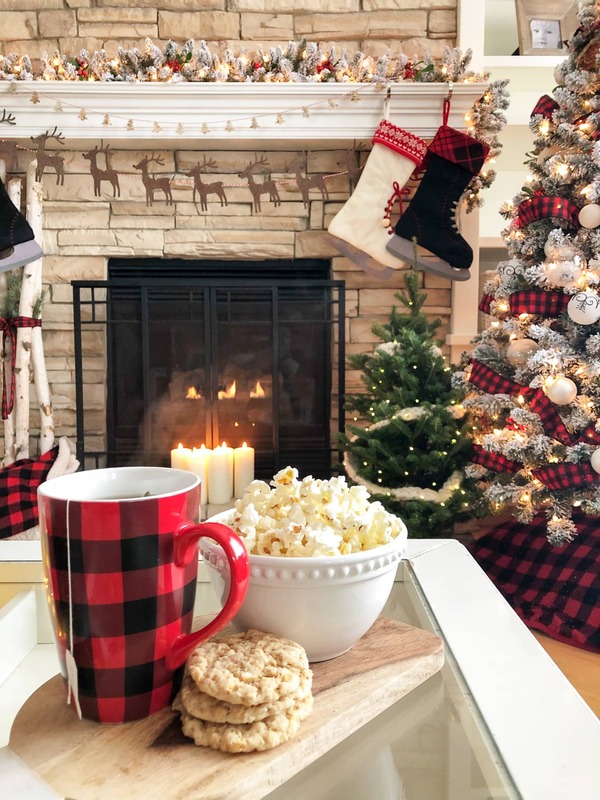 Your home looks like the perfect place to spend a cozy winter vacation, sipping cocoa and playing games. I’m glad you got the pretty ribbon you wanted! Your tree is wonderful! Thank you so much Joann! I’m all about cozy!! Jo-Anna your home looks so warm and cozy and inviting. I love your pretty front porch -how welcoming. And all the red buffalo check is so Christmas-y. I think might be the trees in the flour -so a sweet little detail. Beautiful tour! Merry Christmas! 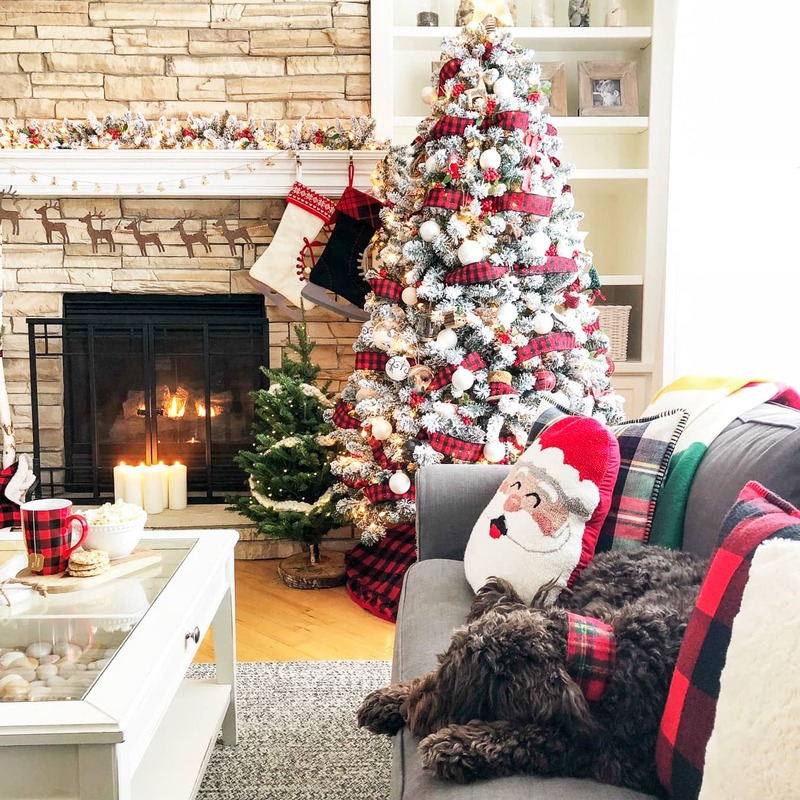 Oh my goodness I want to curl up next to that fireplace and take in the holiday decor! Just lovely.